Because I have no association with either football team in this year’s Super Bowl, all I really care about is what we’re going to eat! I’m have no need to read the sports pages or listen to the experts, trying to figure out if my team has a wining chance. No big deal. I’ll just ponder my repertoire of chili recipes and decide what other deliciousness I can whip together for our little group. I asked Daughter #1 for some suggestions, and she started begging me for these little cheesy broccoli potato bites. Great idea! I’ll be honest, I don’t normally make these for the Super Bowl because I usually have a baked potato bar happening and that would be a little redundant. 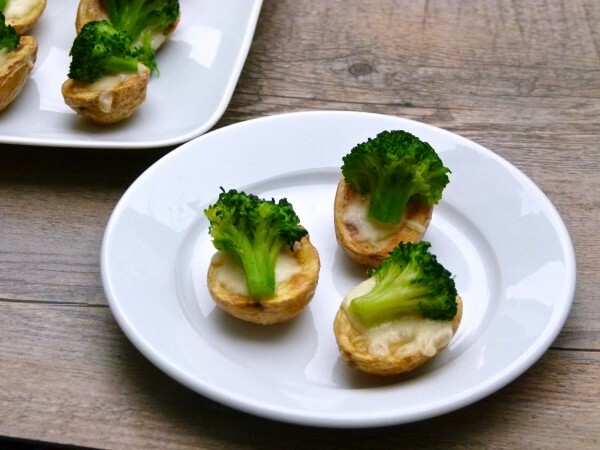 But I do make these baby potato hors d’oeuvres very often for dinner parties, sometimes with broccoli, sometimes with lemon creme fraiche and smoked salmon or roasted cherry tomatoes. But for the Super Bowl, I keep things really casual. Broccoli it is! Just like the mini chicken tostadas I posted the other day, I actually think a mini version of a baked potato is better than the real thing. 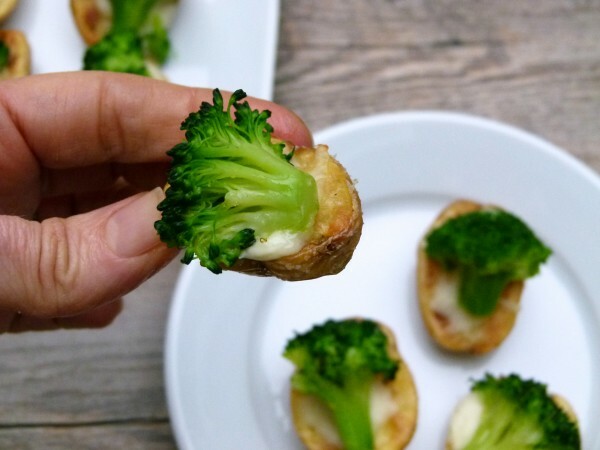 These little bites are super easy to eat and you get the perfect ratio of potato to broccoli to cheese. And the entire bite has a nice bit of saltiness and crispiness. Love it. AND I think we can all agree, this is reasonably healthful stuff to boot! Even if you don’t eat cheese, I’m sure you have found a good non-dairy cheese that you can sub for the mozzarella here. 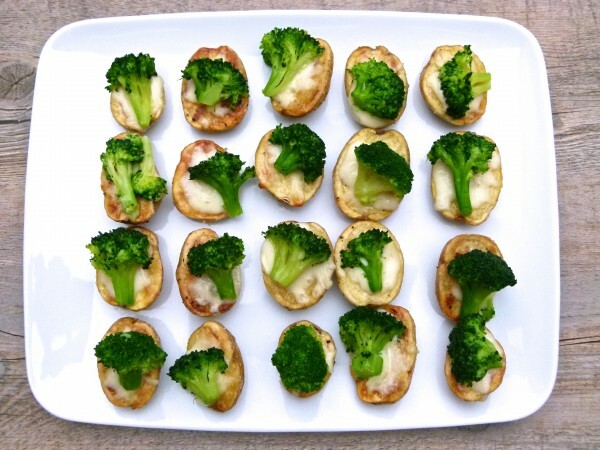 Keep in mind, the melted cheese is what helps the broccoli stick to the potato. Although these baby potatoes are great any time of the year, I do think they’re better suited for cooler weather, or maybe I should say mind-numbing cold weather, depending on where you live. Ugh, sorry if that’s you. Regardless, these bites could very well be the perfect party food. They’re delicious right out of the oven, but they also stay warm for quite a bit. And I think they taste perfectly delicious at room temp, too. You can make the potatoes and the broccoli the day before and then just assemble them with the cheese and bake before you want to serve them. I promise, these will score you major points! Preheat oven to 400 degrees. Line a baking pan with parchment paper. 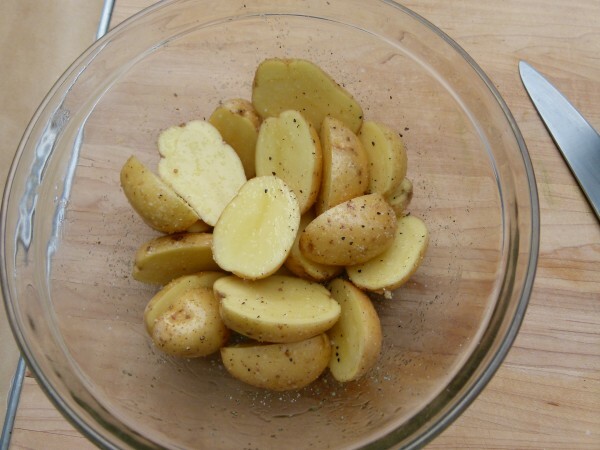 Place potatoes in a bowl and toss with olive oil and sprinkle with a pinch of salt and pepper. 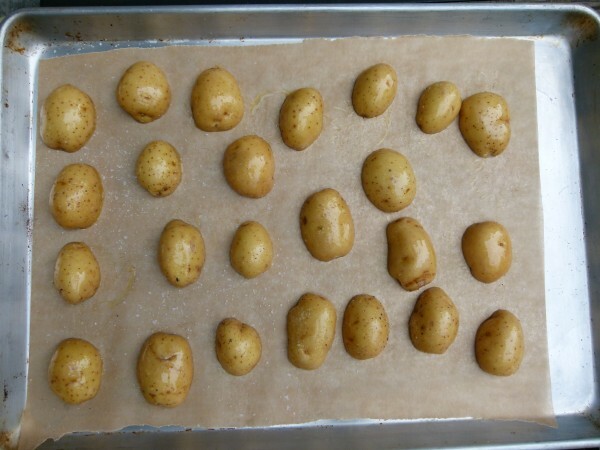 Place potatoes on parchment paper – cut side down and bake for 30 minutes (until golden brown and tender). Leave oven on if serving right away. Place broccoli in a steamer over boiling water and steam until just tender, about 3 minutes (or blanched in salted water for 2 minutes.) If cooking the broccoli ahead of time, remove from the pot and immediately refresh under cold water to stop the cooking process. 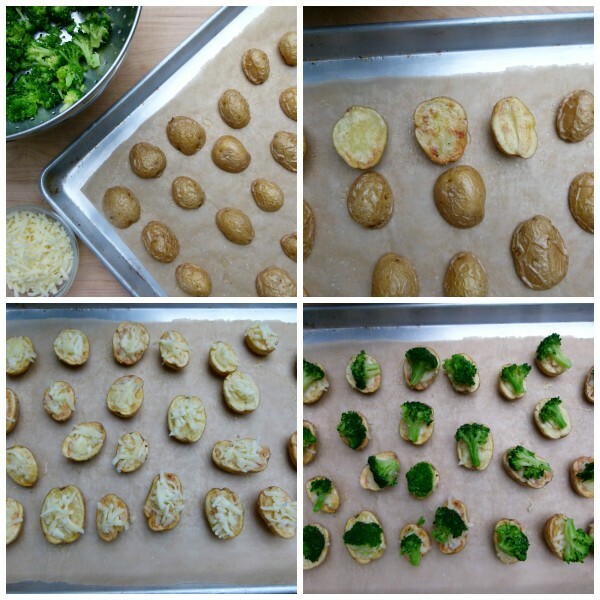 Top each potato with a pinch of cheese and then a broccoli floret and bake until cheese is melted or broil it for a few minutes to speed things up. Sprinkle each with a pinch of grated cheese, if desired. 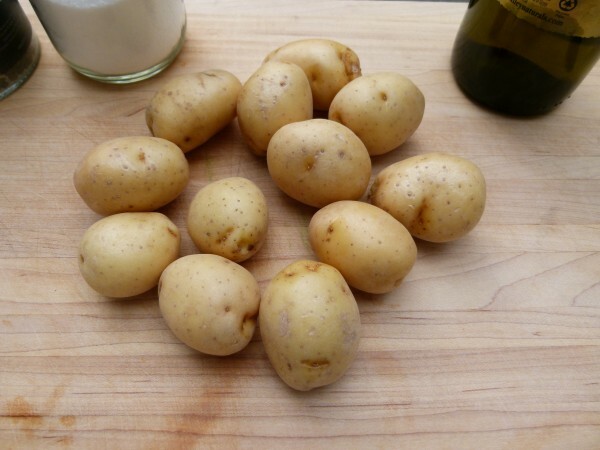 Potatoes can be made the day before and refrigerated; broccoli can be blanched the day before and refrigerated.